Wright USA Crumb Bumper Plate is made in the USA using recycled crumb rubber. These plates are some of the most durable and most economical plates on the market. All plates are a true 450 mm diameter with stainless Steel center insert shaped to the bumper to properly distribute the force of the bar when dropped. Each batch of 25LB - 55LB wright Bumpers are tested to exceed 20,000 drops from 6 foot high. 10LB and 15LB are tested to 7,000 drops. 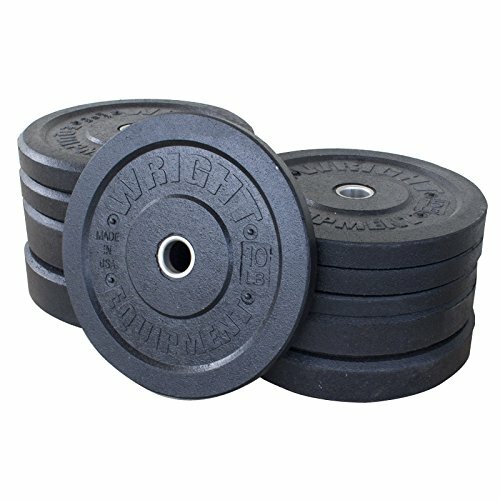 These extremely durable plates will be the best investment for your Crossfit box or home gym and will extend the life of your bar and flooring. Tough enough to handle the punishment of intense daily use whether it is in a High School weight room, University weight room, CrossFit¬ Box, Olympic training center, or your own home gym. If you have any questions about this product by Wright Equipment, contact us by completing and submitting the form below. If you are looking for a specif part number, please include it with your message.